Since launching the ‘Supporting Women and Girls’ (SWAG) programme in May 2017, the SWAG project team has provided life skills workshops to girls and young women from the ages of 10 years upwards to equip them with the essential tools to survive the knocks and challenges posed by life. Thus, workshops on maintaining healthy relationships for young women, goal setting and decision making, educational skills, development training; even creative pursuits have been put on the programme to encourage girls and young women to start making the right choices in life to avoid the common pitfalls. 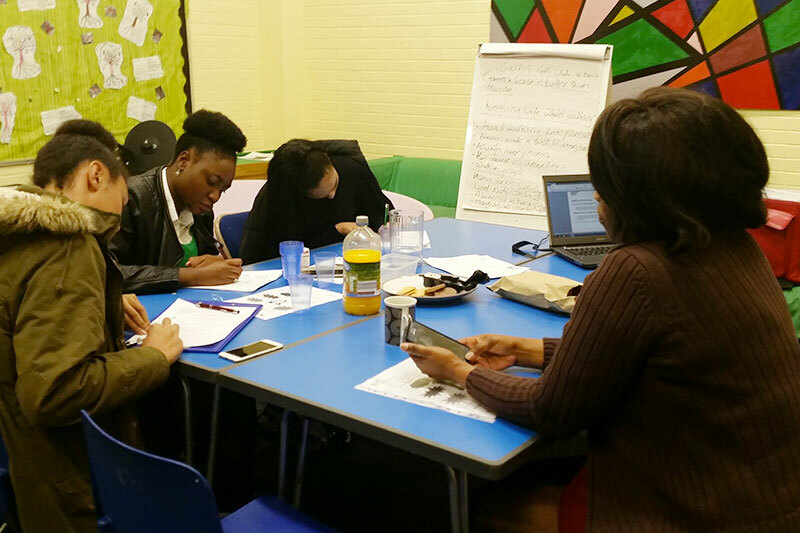 In September 2017, the first of the sessions was delivered at The New House Youth Centre in Sittingbourne. 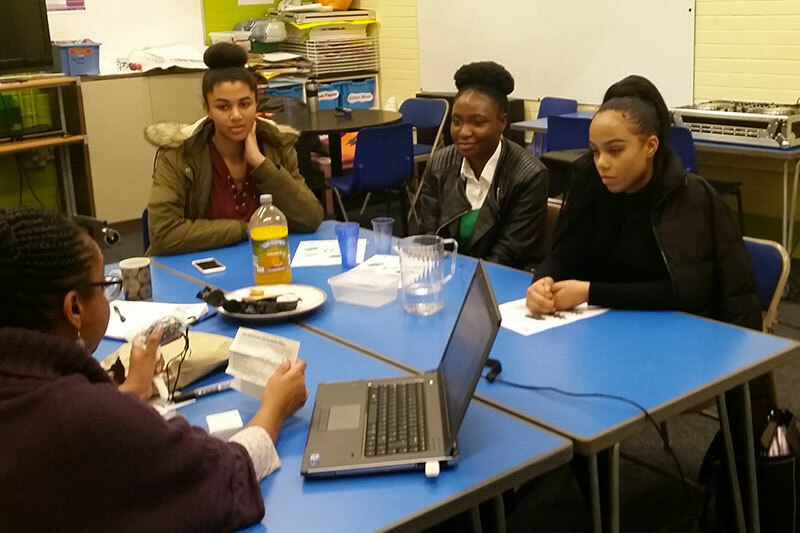 The workshop aimed to motivate the girls aged 11 – 14 years, to think about their self- esteem and ways in which they can build confidence. Each girl was asked to choose a role model whom they admire and think about the qualities they could emulate. The selection of role models was encouraging and included Michelle Obama, Rosa Parks, Beyonce , Arianne Grande and Malala to name but a few. Adjectives such as strong, committed, courageous, powerful, kind and inspirational were offered to describe the chosen role models and the girls suggested ways they too could acquire some of the qualities. The session ended with positive affirmations on how they can change their lives to positively impact their future and the future of those around them. 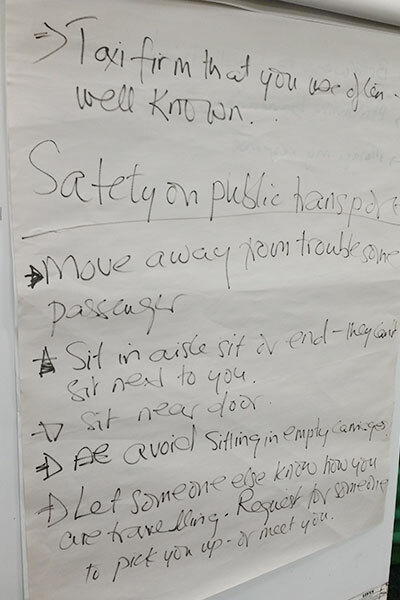 Staying Safe on Public Transport – Continued Life Skills for Women and Girls. 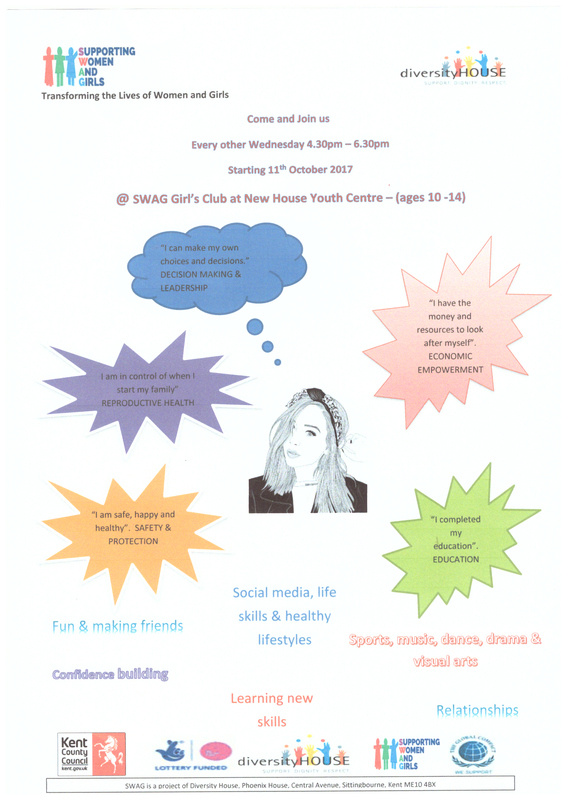 The second workshop on the SWAG Girls Club programme at New House Youth Centre in Sittingbourne was on the subject of safety on public transport. It had been requested by the members as a topic of concern for young women travelling home by themselves. There had been several incidents of such a nature recently in the Swale area and the community requested more action and information so that the girls and young women are better prepared. The SWAG team responded with a workshop called ‘Common Sense is more Important than Muscles – Safety Tips for Girls and Young Women in Public’. The group of young women who were all in the sixth form were reminded firstly that if they were to be a victim of crime, IT’S ONLY THE CRIMINAL’S FAULT and not theirs. Essential information included always carrying mobile phone. Even Kent Police Community Engagement Officer, Ms Sarah Wyatt assisted by contributing panic attack alarms for the girls when she dropped by briefly. All the participants were motivated to come again, expressing how important the workshop was. They felt more confident to go on public transport armed with the knowledge they gained. ‘I found out ways to stay safe that I didn’t know of like sitting at the back of a taxi and avoiding empty train carriages’, said Faith age 17. ‘If you are a victim of crime, always report it,’ concluded Tomisin 17 years.